Directors: Denholm Christie (Chairman), James Lynch, W Kenneth Fee, Ian Hamilton, Helen Davidson. I’d like to purchase a years subscription but I would need to use paypal… can you tell me whether you take paypal. Delivery within the UK is included in the £28 subscription. I received my newspaper yesterday. It makes interesting reading and is informative. The quality of the print is excellent, thanks for the hard work. 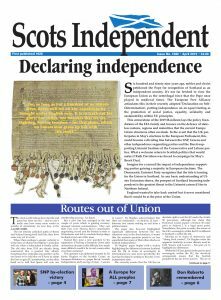 I’ve subscribed for the year and am very happy with your service and my second delivery of “Scots Independent”. Is your newspaper online also? I wish to make an annual subscription to your newspaper. However, I refuse to use PayPal method due to the recent scandal regarding their ‘ownership of personal data’. What alternatives do you have for making a payment? I’d be happy to send cheque or pay by normal debit card. I am currently writing a dissertation on the cultural history of Scottish nationalism and was wondering if you know of any collection of Scots Independent publications from the 1920’s? Don’t know where you are based Chris but the Mitchell library in Glasgow and the National Library in Edinburgh receive anything we publish and make it available to the public. Do you still send out a free copy to schools ? Yes. All secondary libraries and modern study departments. We welcome feedback on whether students actually get access to them.